Yamoussa Bangoura and Guillaume Saladin are best friends and fellow acrobats with a common goal: to incite social change in their respective communities through the circus. They accomplish this through engaging the troubled youth of the Canadian Arctic and Guinea in circus production. 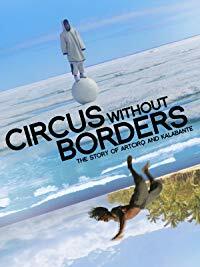 The two circuses they are a part of, Artcirq and Kalabante, help their communities cope with depression, poverty, and violence. In this documentary, the circus becomes a catalyst for international hope. "An Alliance Between Circuses a World Apart," as heard on wbur.org. April 20 2015. Eisner, Ken. “Circus Without Borders Showcases World-Class Athletes in Remote Regions.” The Georgia Straight. March 16 2016. Lederman, Eric. “Margaret Mead Film Festival Coverage: ‘Circus Without Borders’ Review: Fantastically Crafted.” reviewfix.com. October 24 2015. Zhang, Ashley. “Circus Without Borders Reaches DC Schools.” PulitzerCenter.org. October 8 2018.